Setting up your e-mail on Kindle Fire HD involves providing information about one or more e-mail accounts that you’ve already established with a provider such as Gmail. Swipe down from the top of the Home screen to display Settings. The Quick Settings bar appears. The dialog box shown appears. Tap AOL, Exchange, Gmail, Hotmail, Yahoo!, or Other Provider. Enter your username, e-mail address, and password in the appropriate fields, and then tap Next. A new screen appears, displaying two fields. Enter the name that will appear on outgoing messages in the Name field and an address in the E-Mail Address field for your e-mail account. The account name is optional. Enter the password for your e-mail account in the Password field. Tap the Send Mail from This Account by Default check box if you want to set this up as your default e-mail account, and then tap Next. If a message appears about how some accounts sync with your Kindle Fire HD, tap OK to proceed. In the final screen, tap Save and then tap the View Inbox button to go to the inbox for the account you just set up. 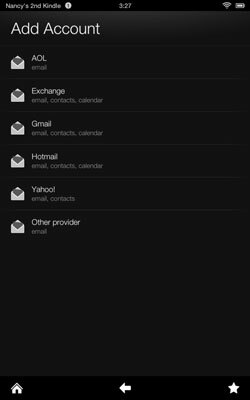 You can set up as many e-mail accounts as you like. 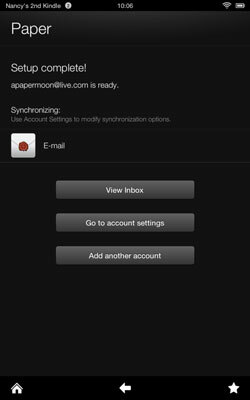 When you open the Kindle Fire HD Email app, you see a Unified Inbox that combines messages from all accounts you set up, as well as individual inboxes for each account.